A couple of months ago, I had listened to a fairy tale, where a young girl Alice wanders through a dreamland, ironically exposing herself to whims and fancies of strange creatures in virtual world, transporting me back to my childhood days, when I could easily accept fancy, without raising a critical brow at the impossibility of another world. And, it may only be destiny that a few weeks down the line, I have picked up a book again based on dreams. Though this time, the dreams are no longer virtual, they have acquired a true meaning, adorned with a deeper hue, swathed in real life clothes! Well, I am talking about ‘The Valkyries’, a novel based on three F’s – Forgetting your past, Forgiving your sins and Fulfilling your dreams, written by none other than the Alchemist famed Paulo Coelho! 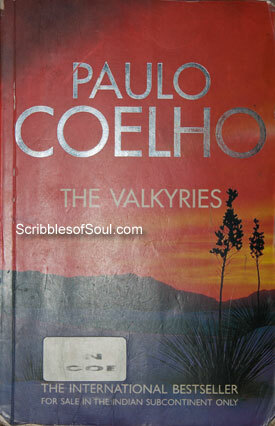 The Valkyries is the story of forty days journey undertaken by Paulo and his wife Chris, though Mojave Desert. Apparently, Paulo has come to the searing desert with a noble ambition – he wishes to speak to his Angel – a mythical creature often talked about but never seen. And, that he eventually accomplishes this impossible task with a little help from modern age Valkyries, forms the core of the story and is well presented in 245 pages of this novel. However, the story, as is usual with Coelho, is of least importance! It is the hidden message that Paulo conveys through this novel, is what every reader would remember, long after he has closed the book. In a twisted tale, Coelho has laid bare his innermost thoughts, has shared some of his life’s secrets, encouraging every one to believe in their dreams, if they ever want them to come true. Here, The Valkyries, a group of leather wearing, motorbike riding bold American women are used as a perfect foil to overlook appearances, overcome our irrational fears and apprehensions and believe in the truthfulness of our dreams. Paulo writes every sentence with the sole motive of inspiring fellow humans to have faith in their beliefs and traditions, even in the wake of toughest cynicism or resistance. He has used his own wife as a cynic, who initially refuses to accept even the possibility of an angel, but soon becomes a medium herself to gain better access to mind’s hidden recesses. The book may appear to non believers as a shady assemblage of ritualistic mumbo-jumbo, but actually that’s what makes it immensely readable. A year ago, I was mighty disappointed with Paulo Coelho’s Brida, as he promised magic in the first page, and then left that promise hung high in air, without bothering to ever justify his theme. But, all my resentment vanished as I finished the present book, as here Paulo has expounded the magic in an unabashed, unparalleled way. Magic here, is not something elusive or secretive, it is the way of life. Though, he did indulge in some unbelievable tactics at the end of the novel, but by that time, I was completely tuned to his purpose and could see the simpler meaning in complex chants. In fact, the best part of the book is where he describes ritual as a routine that we invariably find difficult to escape from. So, beneath the garb of a magical fiction, The Valkyries exhibits the best way to live, by having confidence in one’s own abilities and thoughts. And, here Paulo leads by not only indulging unabashedly in traditional rituals, without fearing any criticism, but also by exposing the darkest years of his life, his innermost feelings and troubled intimacy with his wife, with a boldness, few of the men could ever dare to. Coleho has written the novel in third person, but still convinced the reader in me to believe that the story is a truthful account of his own life. He has presented himself and his wife as the main protagonists, giving it a unique flavor of a short autobiography, concentrating on just 40 days spent in Mojave. I think, the toughest thing for a writer is to rip apart his own past, his deepest emotions, his hidden thoughts for the entire world to see and comment upon. Till now, I believed only Narayan had the guts to do it. But, Paulo has proved me wrong, he had isolated his emotions and presented the story as a factional one, and I quite liked it. After quite a long time, I read a book twice in quick succession, as it touched a chord in my heart, attuned perfectly to my beats, and the persistent reader in me could hardly deny such a wonderful creation, a worthy second read. In any case, we all love reading those books, which somehow mirror our thoughts, presenting them in a more lucid, better comprehensible yet entertaining way. And, Valkyries is indeed such a gem, rich in simplicity, honesty and conviction in one’s beliefs!